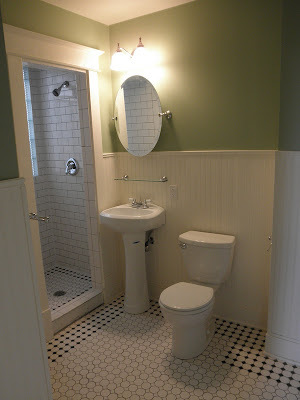 Today I checked out a few houses in the 2011 Minneapolis - Saint Paul Home Tour and it was an awesome experience! The tour celebrates city living and home improvement inspiration and covers a wide range of houses and neighborhoods within the city limits. The best part of the tour? It's FREE! The tour is self guided and will be going on through tomorrow, Sunday May 1st from 1pm-5pm. You can preview the 55 homes on tour here and even select the ones you want to see by theme or location. 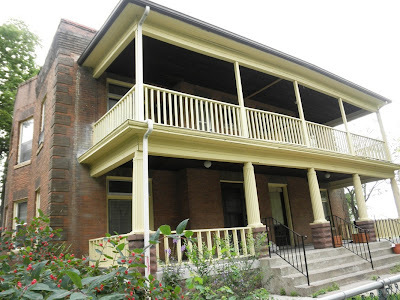 I wanted to make sure I got to see some of the houses being restored in North Minneapolis since this area is close to my heart (I love efforts to help revive this area). I also wanted to select a few that were in the Historic Preservation theme because when it comes to old homes I can't get enough of the historic charm! I went through 8 homes total today, but since this post could get obnoxiously long I'd like to focus on 2 of my favorite NOMI properties and what might be the one of most attention grabbing homes on the tour- the Hewson House. I started my adventure at a recently renovated 1906 Greek Revival 4-plex in Old Highland. Edwin Schumacher and John Fena spent a year renovating and preserving this beautiful historic aparment building. My favorite part about this one? You can take a look at their website and see some of the crazy work they did on this place! I just love demolition action! The kitchen in each unit looks absolutely stunning! I loved the island, stainless steel appliances, and that subway tile! Although this kitchen is new, they tried to maintain that 'old' look for the unit. I think it turned out perfect. The same goes for the bathrooms which still maintain that old feel. Did I mention that I absolutely love the tile work they did in here? I think we may have the same black and white tile in our bathroom. Each unit also has it's original built-in in the dining room. It is such a special touch! Another unique touch is that each spacious unit has a front and back porch, complete with AMAZING skyline views of Minneapolis. This is a very lovely property for future tenants! My other favorite on the tour was this completely renovated 1911 Bungalow in Fowell. I just loved the Mission style wrap around porch that overlooks the large, private front yard that sits atop a small hill. This home feels less like Urban Living, and more like a cottage in the countryside. Inside, this classic bungalow was equally as charming. The original windows, feildstone fireplace and wood beam ceiling added so much warmth and charm to this house. I also stopped at 3915 Lyndale Ave N, 400 31st Ave N, 2201 Ilion Ave N, and 636 Elwood Ave. All of which are worth a look. Simply beautiful homes and a couple were even for sale too! Also, a fun fact I learned today- no resident in North Minneapolis lives more than six blocks from a park, how cool is that? Now let's shift from NOMI onto the Whitter neighborhood for the Hewson House tour. ﻿I'm surprised I didn't know about this historical house at all before the tour, it has quite the story and was almost torn apart in 2009. The previous owners were trying to rehab this historic property and fell victim to the housing crisis resulting in the foreclosure of this amazing home. Shortly after, the home made headlines when an estate sale was planned and the home was to be stripped of it's 'parts' before demolition. Thankfully it was haulted by city officials at the last minute. However, a ceramic tile mural valued at $150,000 was stolen from above a fireplace mantel- crazy! 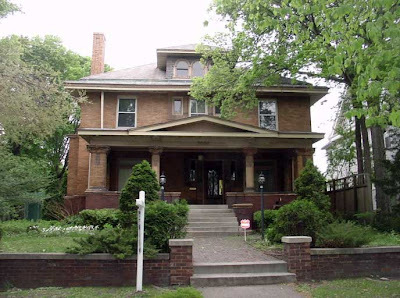 The home was nominated by the Whitter Alliance and chosen by the Preservation Alliance of Minnesota as one of the 10 Most Endangered in 2010. It also has been nominated for local Historic Designation. Here a a few photos of the interior of this massive 6,200-square foot, 3 level house. The main level is very much in-tact and is completely restored. It was so beautiful and grand. The second and third levels of the house are in need of a lot of work. It was pretty heartbreaking, it has so much potential to be beautiful again! I also have to add, each level had 2 sets of staircases, I almost got lost in this huge house! Holy moly, did I count five fireplaces? I might have missed a couple too! The Hewson House is currently listed for sale for $295,000. This really seems like a bargain for so much house! Who ever buys it will indeed be in for a major project, but they will be in for the reward of saving a historic property. I hope the Home Tour brought the right person along to save this place (Alex said that it's just a tad out of our renovation budget). If you are in Minneapolis I hope you get out to see some of the homes on the tour tomorrow! There will also be a TON of NOMI open houses, be sure to get out and see some of these gorgeous homes and neighborhoods! Okay, wa-wa, back to the pillow project for the radiator cover, see you tomorrow! 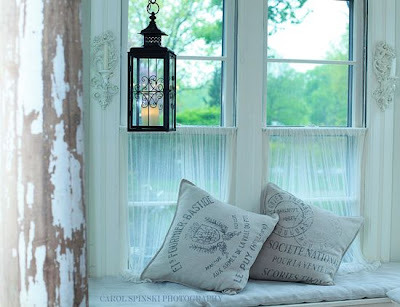 If you like French inspired, ultra dreamy, vintage modern decor then this post is a MUST SEE! 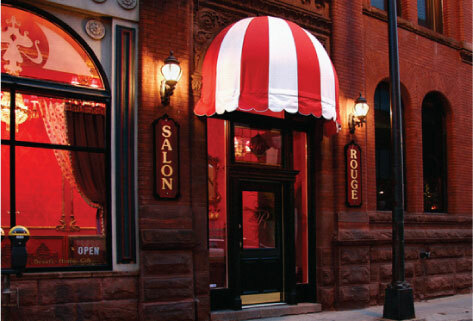 I'm really excited today to share one of my favorite places in Minneapolis, Salon Rouge! I'm am soooo Head Over Heels for this beautiful salon right in the heart of downtown Minneapolis! I was in for a cut on Tuesday and realized I had to share this with my blog friends, local and non-local- it is totally worth a peek! Why I am so in love? Not only do they offer world class hairdressing and beauty services (I always get a glamorous haircut from Nell! ), but the decor is BEAUTIFUL! This salon is decorated with authentic flea market finds from Paris. It is absolutely stunning! 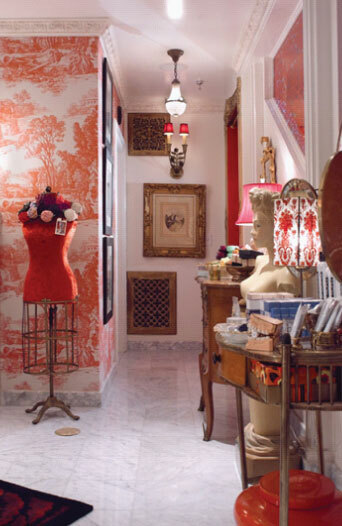 Owner Richard Staab co-designed the salon stating "By mixing antiques with more modern pieces I love creating a space that transports clients somewhere else"~ and it does! 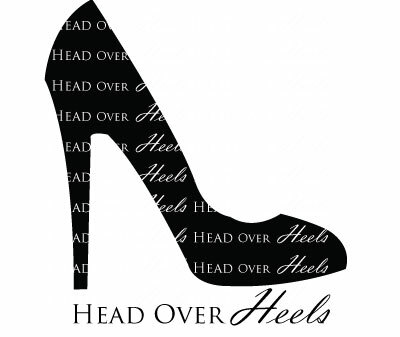 Located off of 13th Street and Hennepin Ave, the salon is positioned in the lower level of an old brownstone building. The basement position only adds to it's charm. I always love walking down the staircase when I enter. 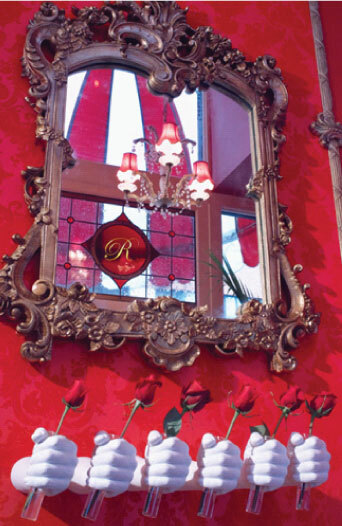 Along the wall are Marie Antoinette style photos inside vintage frames and gorgeous chandeliers hang above. Talk about the red carpet treatment! Since it is the lowest level, it has it's original historic stone walls separating the reception/ store area and the salon. How devine are those red velvet curtains?!? 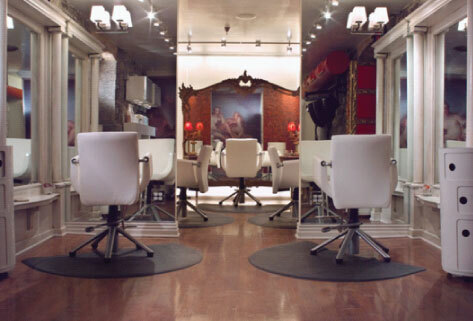 Here is a look at the salon area, isn't is absolutely fabulous? I love that the mirrors are inside vintage woodwork. This is the view of the mirrors on the other side. Love the frames and the red glass tile, just glam! Back in the store/ reception area is more beautiful french inspired decor. 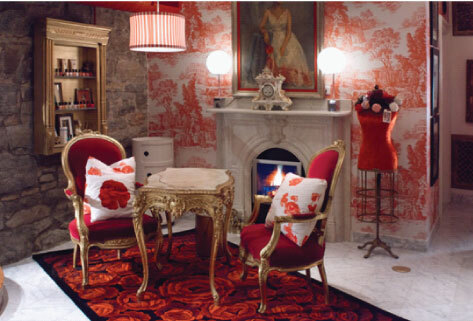 You get a good look at the red and white french toile wallpaper here, I'd love to get my hands on some of that! All of the tables, lamps, frames and dress forms are all vintage finds. The space is just amazing! Here is a closer look at one of the vintage lamps and table display. 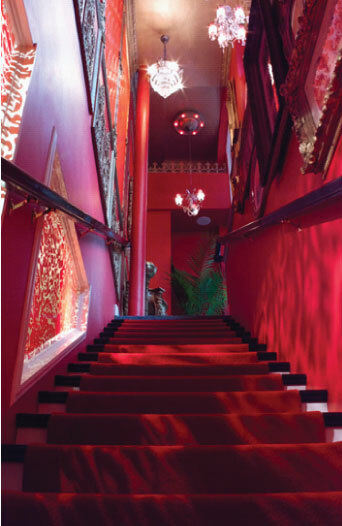 Lastly, here is a look at the first thing you see when you enter the salon at the top of the stairs. How fun and gorgeous is that? Vintage mirror, stained glass, even roses? Sigh, I am waaaaayyyy Head Over Heels for Salon Rouge! If you are in Minneapolis, make sure you stop in to this beautiful salon, or make an appointment, you won't be disappointed! You will leave feeling like you just took a trip to Paris, feeling pampered, and you hair will be looking fabulous! So what did you think? Are you just as in love as I am? Have a great weekend everyone! I will be furiously working away at those pillows for the radiator cover/ window seat! 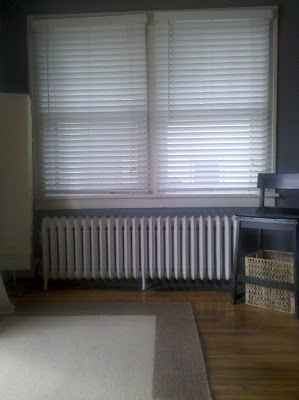 Now that we have a beautiful radiator cover (thanks to Alex's DIY skills!) that also doubles as a window seat, it's time I figure out how we are going to decorate it! I have spent a little time searching for what I would like to decorate with. It is also a little challenging because this room is open to our living room, so the styles need to coordinate/ compliment each other. Luckily, I guess my preferred style still hasn't changed all that much (surprise, surprise). 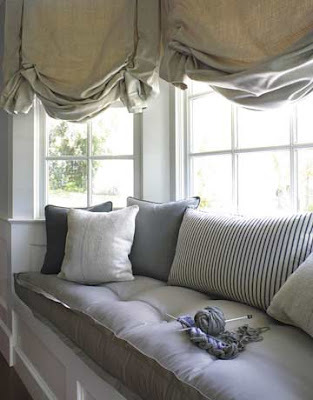 The crisp look of whites and grays mixed with natural sisal and burlap. I also thought about Layla and Kevin's reading room redo over on The Lettered Cottage. 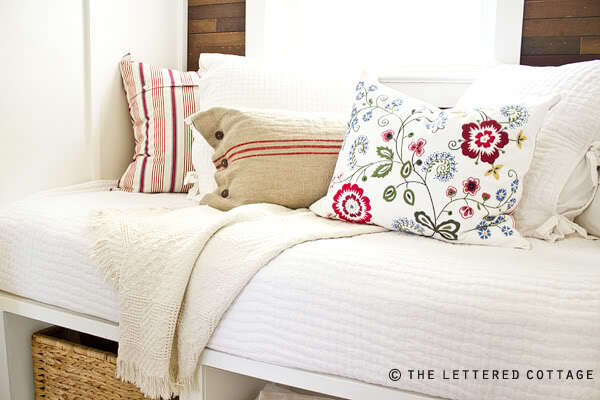 I love their mix of decorative pillows: solid textural white, printed burlap, printed stripes, and one fun embroidered pillow. I think this might be a fun mix for our little window seat, although in greys and blues for our room of course! So, I'm hoping we can improve the look of our empty (although beautifully painted) radiator cover soon. 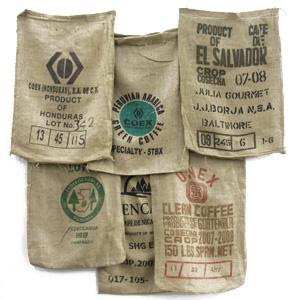 I started to do a little online shopping for the look I was going for. 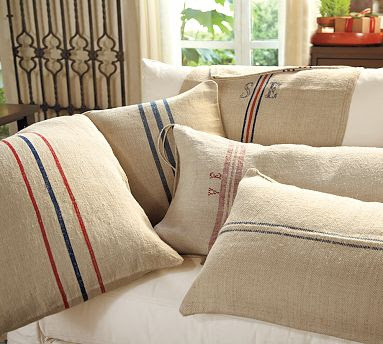 Of course I found these beautiful Vintage Grain Sack Pillows at Pottery Barn that I just loved. Although I did NOT love the $99.00 price tag. It was a heck of a deal totaling $16.09! I'm not going to use all of them on this project. 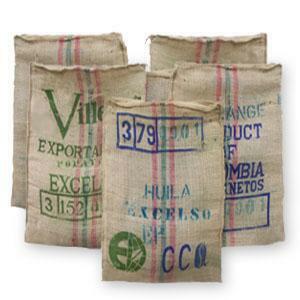 I plan on making a couple pillows- depending on their condition- when I get them (which is in 5-7 business days). I'll be sure to let you know how they look once they arrive! Hammers and High Fives for Sarah! Awesome find! 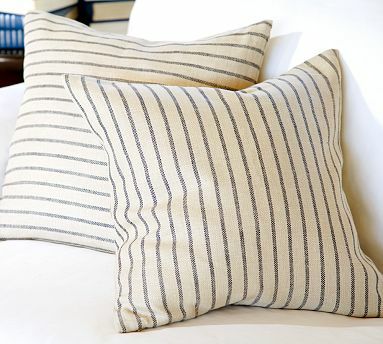 To coordinate with the burlap/ sisal pillows, I think I'll make a couple simple striped pillows like these. Then add a couple simple white pillows like this one. I think it would be really easy to make and I can pick out some cute buttons! Also(this part is for Alex), not sure if I will make a cushion for the bottom of the seat or buy one, but there will be a bottom cushion. Alex was really worried about the cushion part of all this, silly boy! So that's the plan! I hope it works once I get all the materials together and my sewing machine going. If you have any other ideas or suggestions let me know! Last Thursday I had the wonderful opportunity to attend a presentation with Grace Bonney, the creator and blogger behind Design*Sponge. I’m guessing you have come across Design*Sponge before if you are into blogging, but just in case…. Design*Sponge features store and product reviews, city, product and gift guides, DIY projects, before and after furniture and home makeovers, home tours, recipes, and more! Her site has been dubbed ‘Martha Stewart Living for the Millennials' and has 75,000 daily readers- that number boggles my mind! This was the basis for where her blog began back in 2004. Based in Brooklyn, she saw so many creative ideas from local designers that was not being shared anywhere. Many ideas were being born out of DIY projects and handmade crafts, not high priced design. Baffled there was no media coverage of this, she decided to start Design*Sponge as an outlet for what she was seeing and loving. With that, the blog community began sharing and growing. Bonney covered more details on her life, the growth of her blog and how it has evolved over the past 7 years. 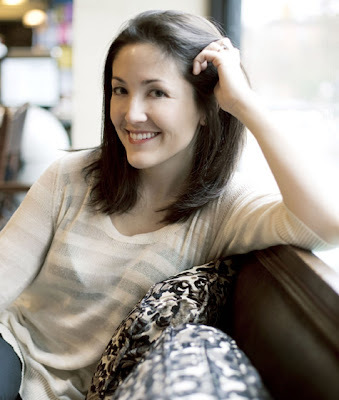 But for this post, I wanted to focus on her advice to designers, bloggers, and other individuals in a creative field. Bear in mind, this is recap of the notes I scribbled down as she presented (they may not be word for word quotes). Creative people need to be pushed in order to make good work, and they need to know what they consider is good work. Trying and failing more than trying and succeeding is okay, trust you will find the right fit. Know what motivates you (her example here was that she worked best with short lead times, when writing she liked seeing her blog posts up right away. Articles for magazines took months before she would see them published). I love it, I believe it. It is true in my day to day experiences at work, at home, in my community, and in the ‘blog world’. I’m always inspired by what I see or what I don’t see- it all leads to an idea. I hope *YOU* found inspiration today! Happy Easter From My Little Easter Bunnies! I can't say the same for my other child, Sadie does not coorperate in these situations. This was the only picture I could get of her with her Easter headband. In the end, this was the best we could do. Happy Easter from our (weird) little family to yours! Radiator Cover Update: Painting Complete! I finished up painting the radiator cover today, hooray! 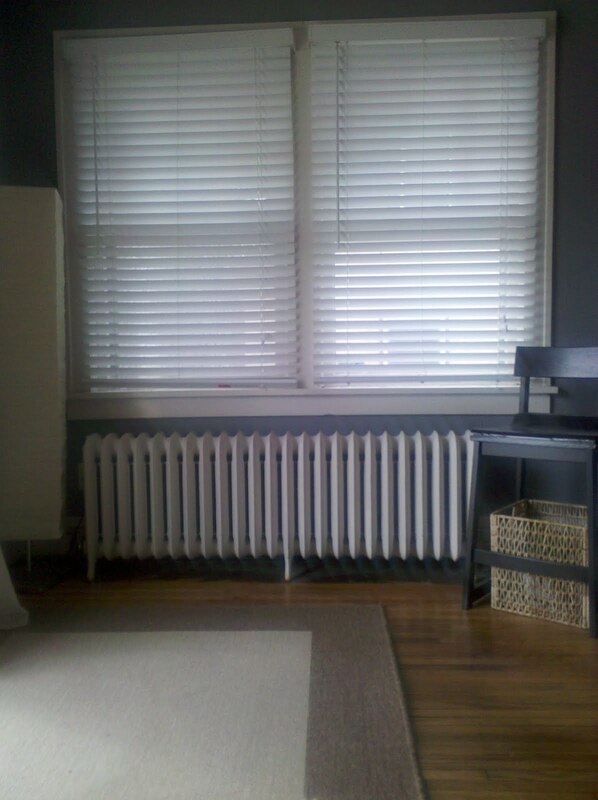 If you'd like to take a look at how Alex built this cover, check our DIY radiator cover post. So here is a 'before' look after I got the trusty blue painters tape in position. Then of course an action shot... oooo... ahhhh! Here is how it was looking after I got 2 coats finished. I used Behr's Polar Bear paint from Home Depot. Polar Bear is the shade of white we have on all of our trim and woodwork in the house. Now just for a look back, here is how the sunroom was looking before. Here is how the room looking now with the radiator cover/ bench built and painted. I can't wait to start the decorating now! I plan to make a cushion and I'd like 2 pillows on each end. Not sure if I will make them or buy them if I find something I like. If you have any decor ideas let me know, I love suggestions! So where was Alex while I was painting 3 coats today??? Last night we went out to El Burrito Mercado in St. Paul for our friend Betsy's birthday dinner. Alex found that the menu offered a burrito called 'Burro Gigante' that he just had to order. 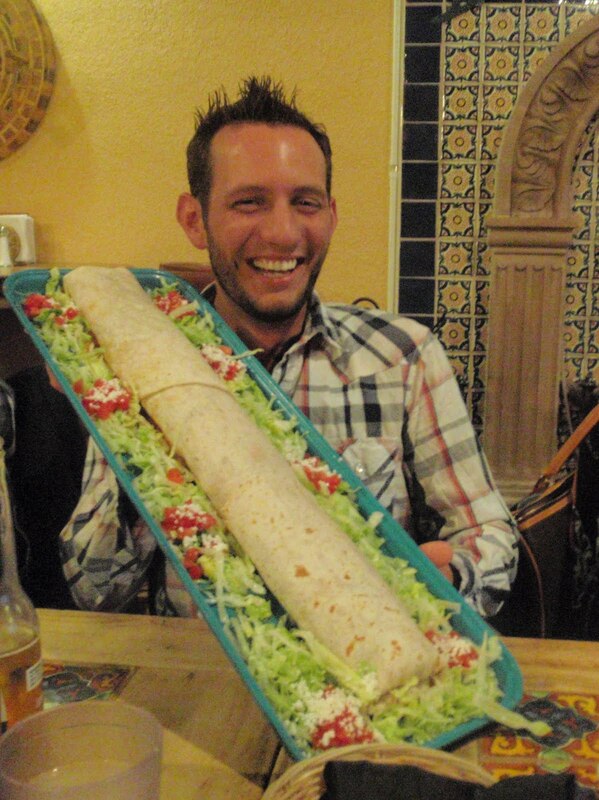 The burrito was 2 feet long (as illustrated below). Boy was he geeked to see his odd looking dinner selection. So anyway, my handy husband has been out riding his bike all day to burn off some of those 10,000 calories he consumed (that he is now regretting). If you are wondering, he managed to consumed all except about 4 inches of that burrito before he called it quits. In the case of Alex versus the giant burrito, the burrito won.